Are you tired of looking for marriage sarees online and shops that matches your requirement? You can tell us your style, we will design it for you. you can whatsapp us at +919677063537 with any saree picture, we will design exactly like you requested. saree designing starts from 20000 and above . Time duration 1 month time. we make with pure kanchipuram silk and gold zari as requested. Marriage is a new beginning in every girl’s life and she wants this special day to be perfect in every way. Bridal outfit is the most important attribute in making her look finest, but choosing accurate wedding saree is very crucial. Do you find yourself falling in the category of brides who want to go traditional but with a twist? You adore the cultural drapes yet want to flaunt the latest trend from a fashion magazine? Worry not. We have here a list of advice, which can help you choose an impeccable outfit for your day. India is the land of textiles, where many types of fabrics are crafted. Most prevalent fabrics of them are silk, chiffon, georgette, velvet, crepe etc. Your wedding day is a special one, so choose fabrics which will compliment your entire look and beautify your personality. Wedding sarees are intricately embellished with heavy zari or resham embroideries which are highlighted with crystals, pearls, sequins or other embellishments. Choose the perfect saree which is has pure fabric with evergreen embellishments and you will be the most beautiful bride ever. Brides, however opt for silk sarees due to great amount of comfort they provide during ceremonies. Motifs and patterns on sarees are derived from our prevailing traditions, culture and heritage. Broad beautiful borders are embossed with motifs of flowers, peacocks, elephants, paisleys, paintings or temples, which smarten the saree entirely. Look for intricate patterns which stand out in the overall saree. Very heavy embellishments in a wedding saree will make you feel uncomfortable during rituals, so pick up carefully. Colors of a saree boost its design and plays vital role during weddings. In olden times Red was considered as most auspicious for bride, but in today’s world brides have become adventurous, they do not hesitate in wearing hues like pink, green, orange, yellow or even off-white during their wedding day. Colors bring happiness and joy around us so be a cheerful bride and opt for beautiful contrasts. It is also crucial to choose the colours which enhance your skin complexion. The brightness of the wedding sarees must not dominate the jewelry, so pick hues which enhances your accessories. Looking for wedding saree at last moment can falter your plans of getting best one at right price. Plan ahead of time and you will get good discount while browsing through the latest trends. We offer seasonal discounts periodically so keep an eye on the offers and go the perfect one which suits your requirements. Blouses play a vivacious role in augmenting the beauty of a saree. Blouses can be made with full embroidery, loaded with sequins, zari or stones. You must choose the right fabric and get them embroidered or embellished with match-able designs. Do not go for very deep cuts during weddings as they will make you uncomfortable. Follow these tips and find a beautiful bridal saree for your upcoming wedding. Sarees not only make you look graceful but they are our cultural heritage also, so take onward your traditions on your wedding day. Indian wedding sarees are valued worldwide for their feminine grace, gorgeousness and stunning look. The spectacular usage of textiles infused with intricate designs enhances the feminine grace of a lady. Saree has evolved in many ways through ages, but its originality stays forever. Draping a saree varies in every Indian region, like Bengali style is quite distinct from Gujarati style. Hence saree draping styles vary from Maharashtra, Mangalore, Kodaya, and Tamil Nadu to Kerela.Wedding silk sarees can make you look sophisticated, modest and angelic; however, if you team it up with a stylish blouse, you can outdo all the western attires around you. How to select saree for stylish draping? Draping the wedding silk saree can be done in number of styles depending on the overall look you want for your wedding. 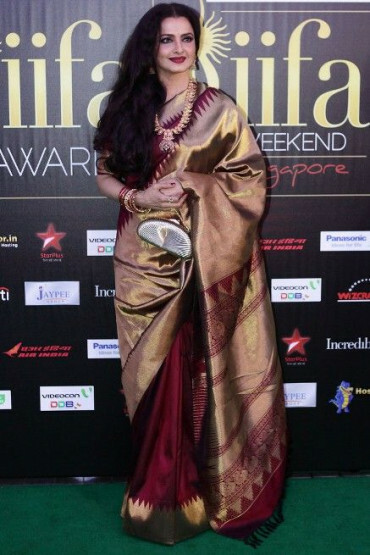 If you want to carry it with a lehanga, then drape it over the long skirt by pleating on the side and take it over your shoulder like a duppatta(another drape). Traditional wedding silk sarees are now adorned by breaking all the status-quos and designers are styling it more practically. You can wear a saree in unconventional style with crop tops/cholis or drape it with bare shoulder look for that bold look. Whether it is a graceful wedding silk saree or shimmering designer saree, finest embroidery saree or splendidly woven saree; drape it creatively to craft an exceptional personality every time. How to select a border saree for your body type? Wedding silk sarees with heavy border and blouses are always in vogue and we must understand how to select the perfect border, which enhances your poise and charm. For the petite ladies, sarees with small border or no border are preferred, while tall women can sport broad bordered sarees. After choosing the precise border for your body type, you must drape the saree in such a manner that the border is perceptible from every angle and it delivers ethnic aspect to your saree. Clumsily draped saree will give you a shabby appearance while neatly worn one will make you look smart. Add accessories like necklaces, earrings, evening bags or bracelets to look fashionable and stylish. How to choose right fabric of wedding silk saree? It is crucial to choose the right fabric of saree for your body type, as it is the fall of the fabric which enhances your curves. For a curvy woman, fabrics like soft silk, georgette or chiffon are preferred, which are available online in wide variety of prints, embroideries and embellishments. These fabrics contribute a slim look and make you look perfectly gorgeous. Choose saree in single bright color for that lovely look and try to select small prints. If you are tall and skinny, then you should carry stiff fabrics like organza, cotton, heavy silk or kora which add more volume to the body. However, slim bodied women can adorn any type of fabric like chiffon, georgette or organza. Keeping these tips and tricks in mind while buying a wedding silk saree; your shopping experience will be great. When buying a sensuous drape, you must follow the guidelines and you will find a perfect saree which will make you look like a Diva. Sarees have been in fashion and will stay trendy forever. Even though fashion changes every day and new trends are introduced, but sarees are here to stay infinitely. There are many reasons why Indian women love sarees like they provide comfort ability, they are stylish, saree collection is unlimited with vast variety of colours, textiles, styles and designs to choose from. Sarees are very versatile and they can be worn on any occasion, whether festive or weddings. Wedding sarees online! Why online? Is it easy to pick the perfect saree from great amount of options available in the market? No it isn’t! Wandering from one shop to another, looking in every market and still not finding the perfect colours which will be love at first sight, is story of every bride. Even if you find the perfect weave that charms you, the price of the saree can overshadow your reverie. How to handle such situations? You are planning to settle for the expensive one! Don’t worry we have a solution. Buy wedding sarees online and save your time and money. Online shopping has become very common nowadays, due to the fact that it is time saving. No need to wander in the markets looking for a lovely saree, just surf online and find an impeccable one for your wedding day. You can filter your search by choosing particular, color, variety and budget. Gorgeous sarees will appear on the screen in your favorite color, which fit within your budget. Huge discounts are also offered occasionally, which will help you get best bargain at reasonable price. Wedding sarees online can be bought conveniently as our online store is open 24/7 and customer support is available during all times. Online saree store can be accessed from anywhere in the world at any time of the day, providing convenience of shopping from your mobile phone or desktop pc. Bridal sarees are in vogue not only in India but throughout the world. Indian fashion industry introduces innovative ways to drape this magnificent dress stylishly and enhances the luxurious look of Indian bride. Wedding sarees onlineare available in lustrous fabrics like silk, georgette, crepe or chiffon. These sarees are embellished with embroideries, stones, crystals or gold woven threads. Bridal sarees bring up the glamour quotient of every bride when draped sophisticatedly with well cut blouses. Contemporary styles of draping sarees can make you look ethereal yet modern in every party. Wedding sarees online are available in kanjivaram silk, banarsi silk, embroidered georgettes, Mysore silk and many other varieties. Choose a trendy outfit to adorn on your special day as it will be treasured forever. The color chosen should be evergreen and embroideries must be intricately done with pure silk or zari threads. Enhance your saree with matching accessories like kundan jewellery or chandbalis etc. Get a perfect look with matha patti( head gear) or passa on your forehead and look like an angel descending from heaven while going to mandap. Go ahead and look for a gorgeous wedding saree online at our website and shine bright like a diamond on your wedding.